Get Faster Growing, Stronger Hair with Improved Shine and Smoothness! Advanced hair & scalp dietary supplement enhanced with Vitamin B-12, Zinc, Manganese, Zinc, Chlorophyll, and over 17 amino acids. Great for skin and nails, too! Follicleanse Hair Vitamins! Advanced hair & scalp dietary supplement enhanced with Vitamin B-12, Zinc, Manganese, Zinc, Chlorophyll, and over 17 amino acids. Did you know that lack of proper vitamins, minerals and amino acids is one of the primary causes of slow hair growth, breakage and dulling? 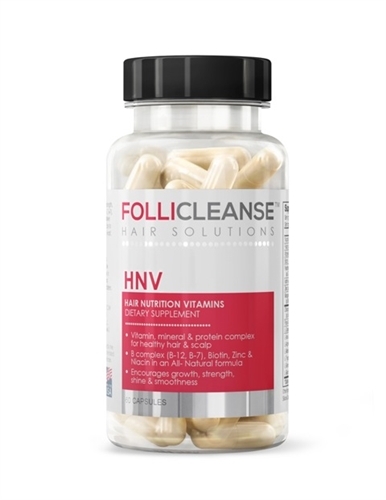 Follicleanse HNV hair vitamins were developed specifically to provide the suggested and recommended nutrition needed to promote the healthiest hair possible. Follicleanse is a broad-spectrum source for B-Complex (B-12, B-7, B-3), D-Calcium, amino acids, proteins, and minerals to deliver balanced nutrition for beautiful hair. Easy to swallow, all-natural, vegan capsules contain no yeast, soy or sugar. Guard against nutrition-based weakness, dryness, dulling with Follicleanse HNV hair vitamins…an integral component to any hair revitalization regimen. Lack of proper nutrition is often a culprit when it comes to shedding, splitting, thinning, scalp problems or poor follicle development. Deficiencies in key vitamins and minerals can play havoc on your hair and scalp…and, can lead to shortened growing phases, and degraded strength and shine. Take 2 Capsules per day, one in the morning with a meal and one in the evening with a meal.